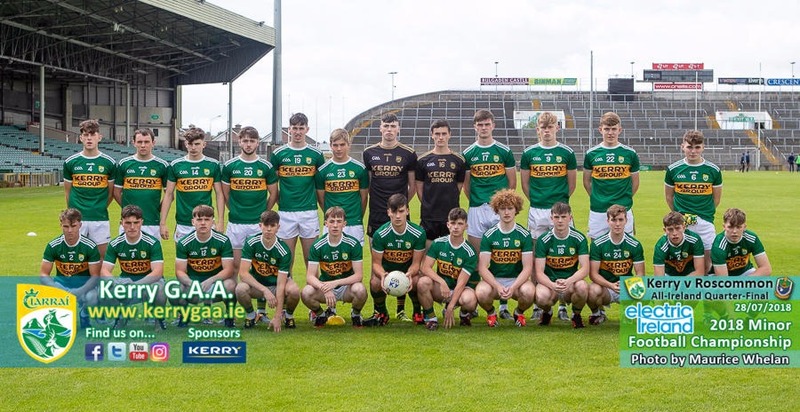 A flurry of scores in the five-minutes spell immediately before half-time proved decisive as Kerry eased their way into the last four of the All-Ireland minor football championship this afternoon, overcoming a hard-working Roscommon side in breezy conditions at the Gaelic Grounds in Limerick. Kerry won the toss and seized the opportunity to play with the wind in the first half, wasting no time in building up an early lead. The movement and interplay of their forward line was simply superb as they fired over three points in the first four minutes, with Ruaidhrí Ó’Beaglaoích, Patrick D’Arcy and Paul Walsh all on the scoresheet. Walsh put in a man of the match performance over the course of the hour’s play here, chipping in with five scores but also getting on countless possessions, bringing his colleagues into the game and stretching the Roscommon defence. However at the other end of the field, Roscommon’s attack also looked lively, even though they struggled in the early stages to find their range. Any possession outside the “D” was also outside scoring range for them in the first half and they missed a few early opportunities as they learned that lesson, but closer to goal James Fitzpatrick had a fine outing as he buzzed around the full forward line, offering himself as a good outlet for high and low ball. Meanwhile, further out the field Fearghus Lennon and Charlie Carthy were threatening with the ball in hand. Lennon shot their only point in the first quarter, but they sprung into life in response to a Kerry goal in the 16th minute, well finished by Ó’Beaglaoích as he pounced on a controlled break from Walsh. Fitzpatrick kicked two points and Adam McDermott chipped over another as Roscommon stayed in touch, trailing by just 1-5 to 0-4 as the clocked ticked into the 27th minute of the game. What followed between that moment and half time was scintillating, as Kerry moved through the gears with some fabulous football. Their goal was workmanlike, palmed to the net by Killian Falvey after good handpassing opened up the defence, but the shooting from Walsh, Darragh Rahilly and Paul O’Shea was utterly sublime as they moved 2-10 to 0-4 clear by the interval. After the break Roscommon found a little bit more freedom up front, aided by the fact that they could now shoot from distance. Richard Walsh lobbed over a good score from 35 metres out after 40 seconds of play and Lennon set up Carthy for a goal soon after, but Kerry’s attacking threat never went away and the Kingdom were able to keep their opponents at bay. D’Arcy split the uprights from the right wing, Walsh scored from play and added a free, as they restored their double figure lead, 2-13 to 1-6. Roscommon midfielder Shane Cunnane had struggled to get into the game in the first half but he was now posted on the edge of the square, and his fielding ability yielded a rich dividend when he leapt up to claim a high ball from his St. Brigid’s colleague Robbie Dolan and then set up Fearghus Lennon for another Roscommon goal. Ultimately however, that was to be the Connacht county’s last score until the closing minutes as Kerry’s back division took control of the tie, swatting away Roscommon attacks and closing out a win that sets up a semi-final clash with Monaghan in a fortnight’s time. Scorers for Kerry: Paul Walsh 0-5 (0-2f), Ruaidhrí Ó’Beaglaoích 1-1, Patrick D’Arcy 0-3, Killian Falvey 1-0, Darragh Rahilly, Paul O’Shea and Dylan Geaney (0-1f) 0-2 each, Michael Lenihan 0-1. Scorers for Roscommon: Fearghus Lennon 1-1, James Fitzpatrick 0-3, Charlie Carthy 1-0, Adam McDermott 0-2, Richard Walsh 0-1. KERRY: Marc Kelliher; Conor Flannery, Colm Moriarty, Owen Fitzgerald; Dan McCarthy, Dan Murphy, David Mangan; Darragh Lyne, Paul O’Shea; Darragh Rahilly, Patrick D’Arcy, Killian Falvey; Paul Walsh, Ruaidhrí Ó’Beaglaoích, Dylan Geaney.Subs: Jack O’Connor for Ó’Beaglaoích (HT), Seán Quilter for Falvey (52), Michael Lenihan for Geaney (59), Kieran O’Donoghue for Fitzgerald (60+1), Jack Kennelly for D’Arcy (60+1), David Dineen for Rahilly (60+2). ROSCOMMON: Daniel Connolly; Cathal Brogan, Dylan Gaughan, Seán Trundle; Robbie Dolan, Colin Walsh, Jack Lohan; Shane Cunnane, Jonathan Hester; Charlie Carthy, Fearghus Lennon, Richard Walsh; Eoghan Derwin, Adam McDermott, James Fitzpatrick. Subs: Ronan Garvin for Derwin (40), Niall Moran for C Walsh (43), Aaron McDermott for Hester (48), Kealan Gunning for Dolan (57), Daire Cregg for Carthy (60+1), David Wynne for Gaughan (60+2).